We speak to Rachel Edney about her journey to becoming an acupuncture practitioner. 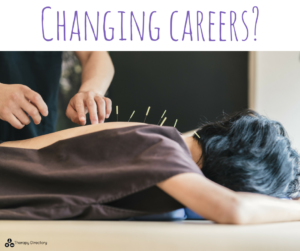 Are you considering changing careers? If you’re thinking about retraining and entering the world of complementary therapy, you probably have a lot of questions. We spoke to Therapy Directory member Rachel Edney about how she found herself retraining to become an acupuncture practitioner and why the struggle is worth it. We have all read those inspiring stories in magazines of high flyers turning their backs on the city to start new satisfying jobs. You may finish reading their story feeling anything is possible, and start researching the possibility of turning your long-cherished dream of retraining into a reality. It is at this point you realise that it isn’t going to be easy without that nest egg of thousands from the sale of a flat in central London and your heart begins to sink. My journey to becoming an acupuncturist certainly wasn’t easy, but full of delays and days when I felt like I was running a marathon uphill. In my twenties, I was working long hours as an information analyst and was no stranger to that sinking feeling on a Sunday when I thought about my working week ahead. Feeling frazzled and bored, I knew that I was straying from my path. It was at this time that I heard about a series of lectures by the acupuncturist Nora Franglen on the Five Elements and I began travelling to London from Kent ever y week to learn about this profound Oriental philosophy. train as an acupuncturist myself. I did my homework so I knew which course I wanted to do, and I knew how much it would cost. It would take, however, two years to find a job in London that would pay enough to support me and pay the course fees. Working full time and doing a degree-level course was more demanding than I ever imagined and I only got through it because my employers were supportive. Nobody complained when I took the pulses of everyone in the office twice a day to achieve the target of hundreds required of me. I left office parties early as I had college the following day and during my final year I worked 7 days a week. I am not telling you this to deter you from taking that dream course, but instead to tell you that every hour of extra work and every penny spent is worth it. Don’t interpret obstacles in your training as signs that you are on the wrong path. They are just obstacles so do whatever it takes to go over them, go around them or go under them if you need to. There will be times during your course when you are reading yet another textbook that you think you will never have time to read a novel again, but you will. You think that you will lose your friends when you have to turn down another invitation out so that you can write another essay, but you won’t. You might wear the same clothes for three years and can’t imagine having the spare money to buy a new outfit ever again, but you will, and what’s more the satisfaction from achieving your goal makes these sacrifices all worthwhile.